Enter Matthews. 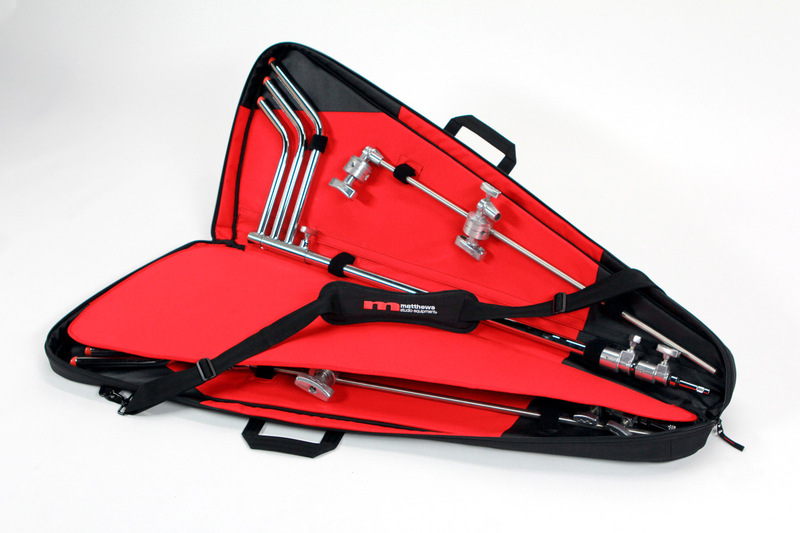 (they say they invented C-stand, but I am really not that old to know this…). Matthews came up with two bags to transport C-Stands; one to put on your shoulder, and one with wheels. The standard setup of a C-stand is to put the longest, largest leg under the arm so the whole thing doesn’t tip over. 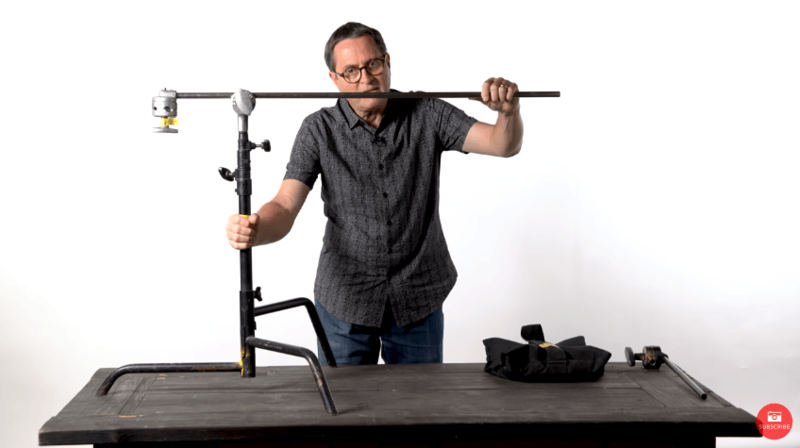 This is a correct way, but Jay P. Morgan suggests you another one, which will help you maximize the usable length of the arm, and still keep the C-stand stable. C-Stands have been a staple support system in the photography and film industries for longer than many of us can remember, but there’s more to this seemingly simple tool than one might assume at first glance. 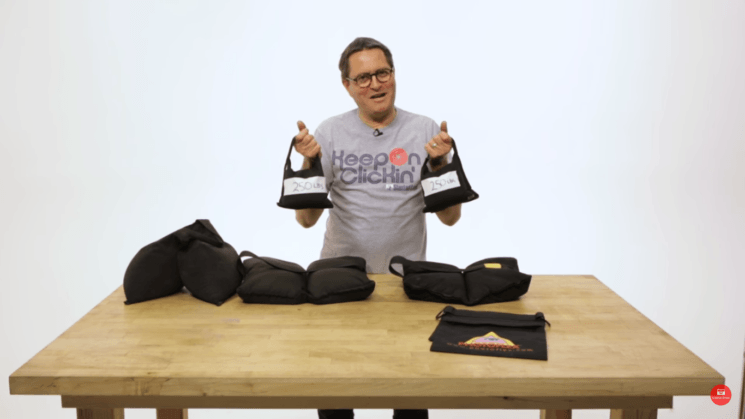 This video from Jay P. Morgan of The Slanted Lens shows us everything there is to know about these humble yet very versatile light stands. C-stands are undoubtedly one of the most important tools for a setting up (big) lights and other heavy equipment. But while using a C-stand may seem trivial, if not done in the right way it’s just begging for a broken rib/light/head or possibly all three. The combination of “heavy” with “high” does require some know-how to avoid an accident. And the team at RocketJump Film School share the three critical tips to avoid a stand falling on your head. There comes a point at any photographer or videographer’s life where they start using big lights or other big gear and migrate to C-stands. Ok, not every photographer. But if you have never used a C-stand you are definitely in for a treat. The only thing is that C-stands take a little more know-how to use safety than light stands. This is where Eric Jang and his C-Stands 101 comes in. The movie is only about 10 minutes long, but is highly recommended if you are handling C-stands and even more so if you are doing it near people or in small production spaces. And is a must if you ever consider working as Grip. Here are just a few tips that I picked up. Some, I already did out of habit or intuition, but hearing them said like rules just helps sort them out in my head. 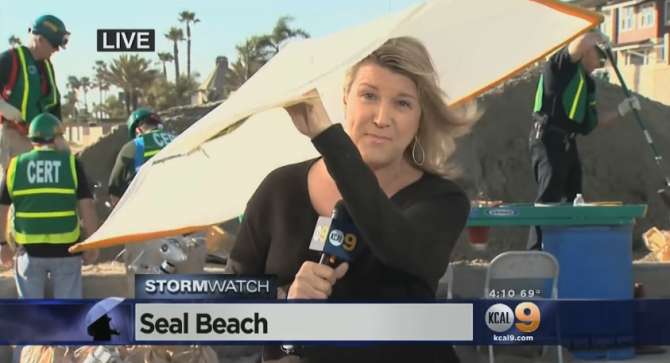 Earlier this year, southern California was hit with several big storms. Home owners used sand bags to protect their houses from the 14-16 feet high waves. In a wonderful gesture, community volunteers at Seal Beach helped residents fill up sand bags which are used to block the wave’s impact. CBS local reporter Michele Gile was covering this event on site. Ironically it looks like Gile may have been caught up in a sand bag situation of her own. Youtuber GasperEdits shares an out-take showing why it is so critical to always, always sandbag your C-stands.